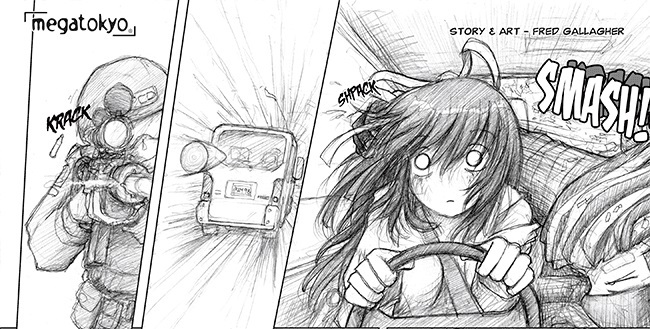 The past several weeks have been up and down for Fred and Megatokyo. Fred's dad had surgery, and with his age and health issues that required a lot of help from Fred. Also, Fred struggled with the comics over the last month. He's happy with the results, but the actual process of creating them was more difficult and time-consuming than usual. Fred did get some work done on the visual novel, continuing to clean up and improve some of the early Largo character drawings. Hopefully the comic production will flow better again soon, and that'll leave him more time for visual novel work. In spite of Fred's struggles with the comic, he did just meet his goal of getting 4 comics done for May, and they're good ones. The first comic for June should be coming soon. Thanks again to supporters of Fred's Patreon for helping make the more frequent comics possible. 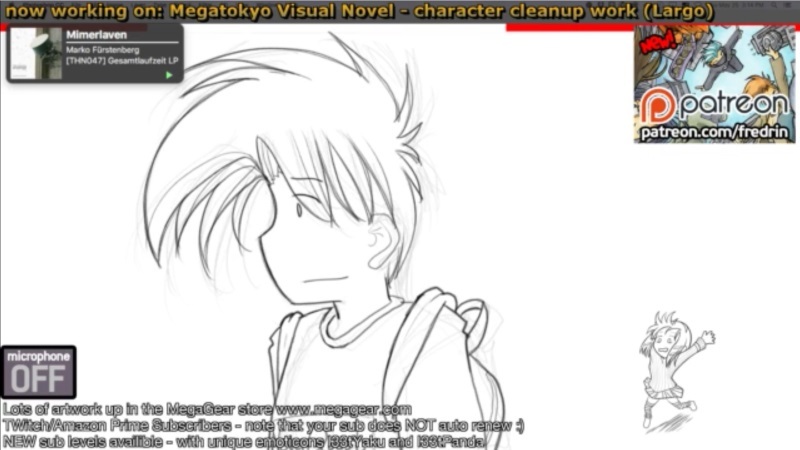 Speaking of the comic, the main Megatokyo website has been moved to a new server. Fred drew the picture above of the new server (Yumemi) comforting the old server (Akiko), who is very tired. With Yumemi, the site should be faster and more reliable than with poor tired Akiko. We also updated the Megatokyo forums to a new server and updated software. Posts from the old forum were not brought forward to the new, but the old forum is still visible if you want to look at an old post. People who had visited the old forum while logged in sometime in the last year have had their accounts migrated to the new site. This new forum should also be faster and more reliable than the old. 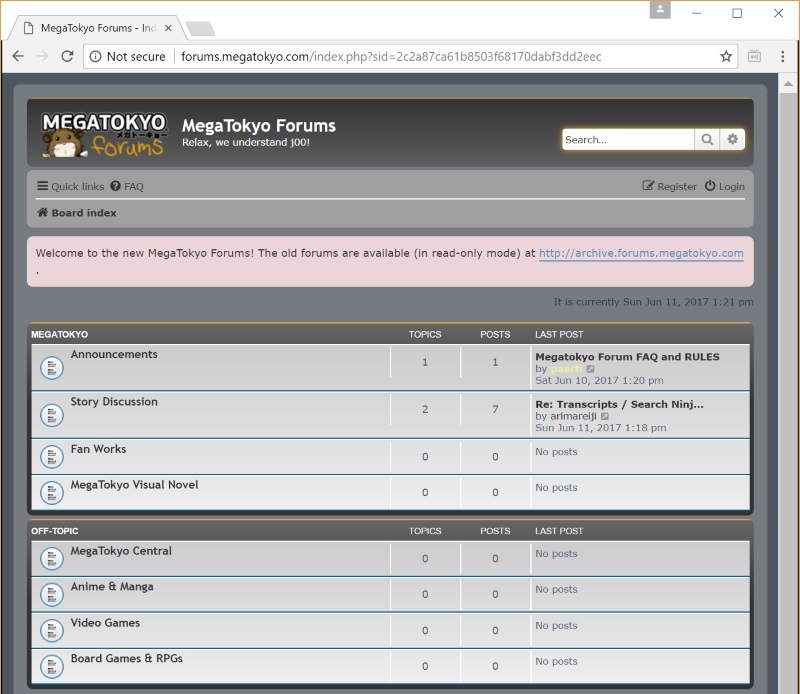 The forum for discussion of the Megatokyo Visual Novel is now part of the main Megatokyo Forum, where hopefully it will not get overrun by spambots like the old VN forum was. Sorry this is taking so long. Thank you all very much for your patience and your support. *thumbs up* here's hoping for another beta this year. maybe a release of the first of the three games next year. is there a way to check if our old forum acct was migrated? How will this affect those of us who did the beta option from Kickstarter in regards to the VN and the VN forums? None of the accounts from the VN forum were migrated over. It was so overrun by spambots that it would have been really hard to filter out the real human accounts. Accounts on the old MT forum that had been active in the last year were migrated over. You can click the Members link at the bottom of the page (next to the Team link) and that will show you all the current account names. Darkmorford set up a forum section here for MTVN beta discussion. But we haven't made it available to anyone yet. There isn't much beta to discuss at the moment, and I thought it might be better to concentrate all the VN talk in one area for now. As we get closer to our next release, we'll try to figure out what we're doing there. Let us know if you have any suggestions. Awesome! Makes sense to concentrate it like that. Frankly, the way this whole forum thing has been handled was probably the absolute best way to do it. Thumbs up guys, you did good. New forum, and finally a new laptop. I've been without a computer since about a month after the kickstarter ended so I missed out on 3 years of the sampling of prior betas. Still, at long last I can participate properly!